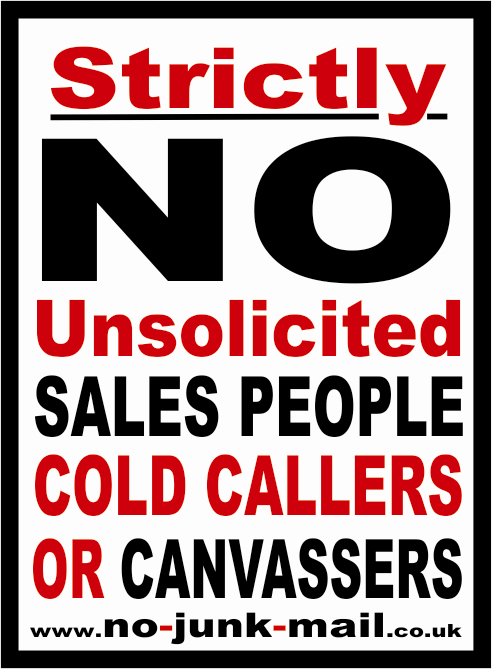 These Signs And Stickers Are Designed To Stop Unwanted/Uninvited Sales People Knocking On Your Door Attempting To Sell You Goods And Services You Do Not Want. There Are Many Designs Of Stickers And Signs Available To Buy Or You Can Get Free "No Cold Callers" Stickers From Many Local Councils And Trading Standard Offices Across The UK. Our Sticker Displays A Clear And Simple Message To The Sale People And Canvassers And Is Designed To Simply Peel And Stick Next To Your Doorbell Or Door Knocker. (Click To See Images Of Our Sticker). Most, If Not All These Types Of Stickers Will Never Be 100% Effective Without The Support Of A Registered "No Cold Calling Zone"(NCCZ). A Registered NCCZ Can Enforce A Communities Stance Against Unwanted Sales People, But It Requires A Community To Come Together And Register A Designated Area With Their Local Council And Trading Standards Agency, This Will Often Take Time And May Require Some Funding From Local Business, It Is Ideal That These NCCZ Are Set Up By Local Neighborhood Watch Schemes As They Already Have The Interest And The Safety Of Their Own Community Within The Scheme. The Main Problem Is That Many Sales Agents/Canvassers Are On A Commission Based Salary. The More Of Their Product They Sell The More Money They Earn. Therefore They Will Sometimes Ignore Or Are Often Told To Ignore These "No Cold Calling Signs". We Have Spoken To Several Home Insulation Canvassers Who Will Say "We Are Not Selling You Anything" "ITS FREE", This Is A Common Excuse Used By These Sales People. YES, It May Be Free, But They Want You To Sign A Sales Agreement With Their Company To Supply You With This FREE Product, That's Only If You Qualify For It To Be 100% Free. THEREFORE THEY ARE SELLING YOU SOMETHING. These Signs Cannot Stop Religious Or Political Candidates. In Fact They Are Not Selling You Anything At All, They Are Just Sharing Their Views And Beliefs, If You Asked For Them Or Not. Don't Be Fooled By Rogue Traders See Our Fighting Door Step Crime Page.